You are browsing the Blog for Audi TT 8N (1998 to 2006) Archives - Audi How To. When you are searching for something to your cas, sometimes it’s usefull to know what is the code of the engine. 1. Look in your service book. On the first you’ll have a black and white sticker. 2. Look in your spare tyre well, and you’ll find the same black and white sticker. This sticker have severall information regarding your car (engine code, gearbox code, paint code, trim code and all the option codes). 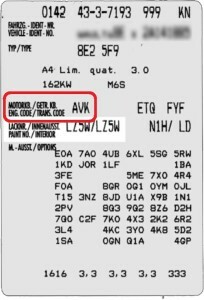 The engine code is the first information on the 4th line (highlighted in red in the image on the left).